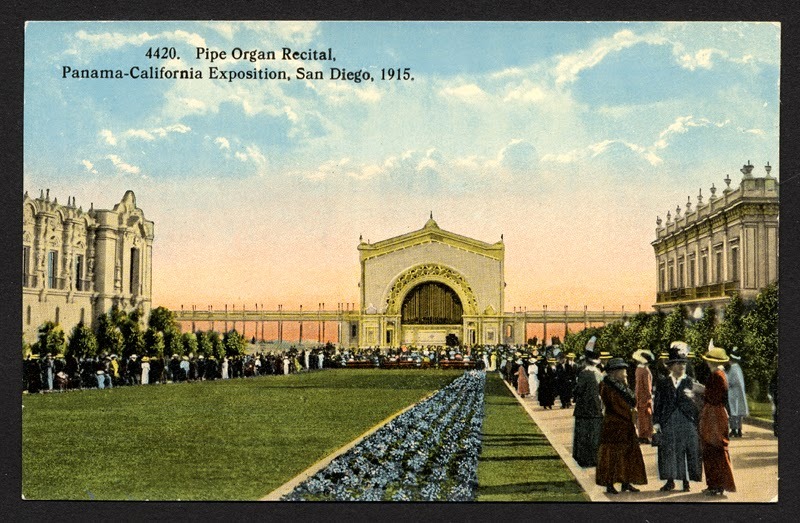 For the last couple years San Diego has been attempting to put together a huge celebration of the 100 year anniversary of the 1915 Exposition in Balboa Park. 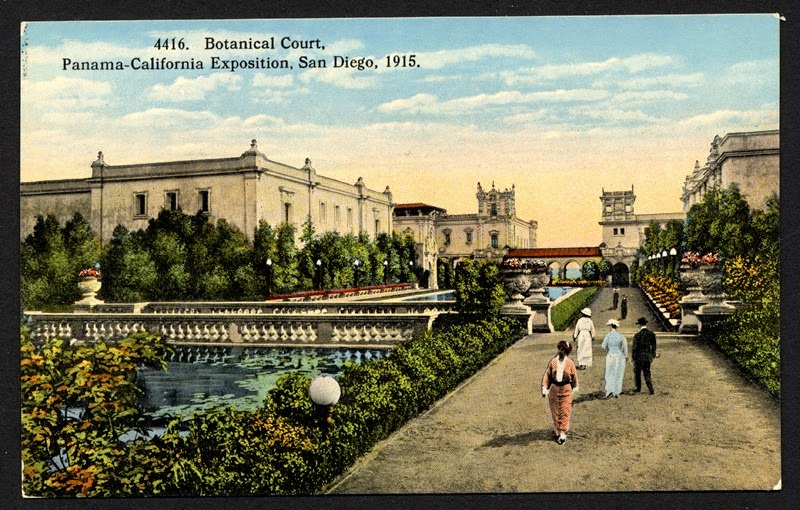 The Expo, which opened in January of that year, was organized in conjunction with the grand opening of the Panama Canal, and to entice travelers to come to San Diego as the first port of call after their westward trip through the canal. The original centennial plan from last year fell through but a grassroots organization rebooted it and is scheduled for April 11-12, 2015. 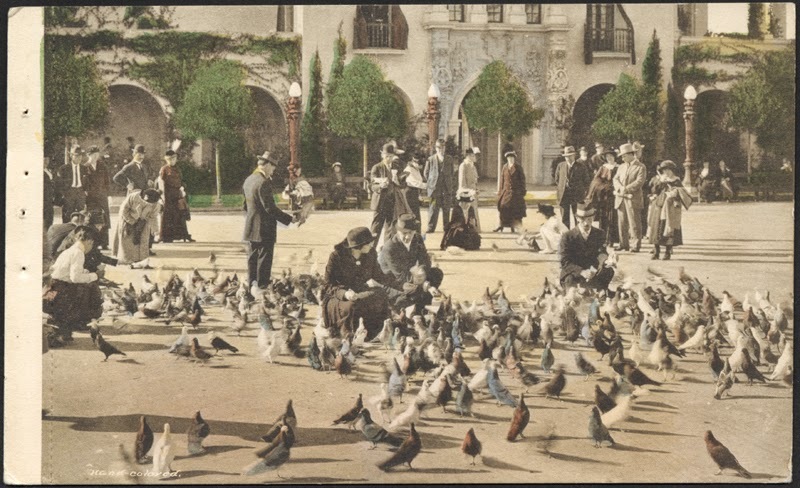 Our San Diego Costume Guild, and anyone else interested, has been invited to join along in costume to provide a visual trip to the past, and we've been planning our costumes for it. 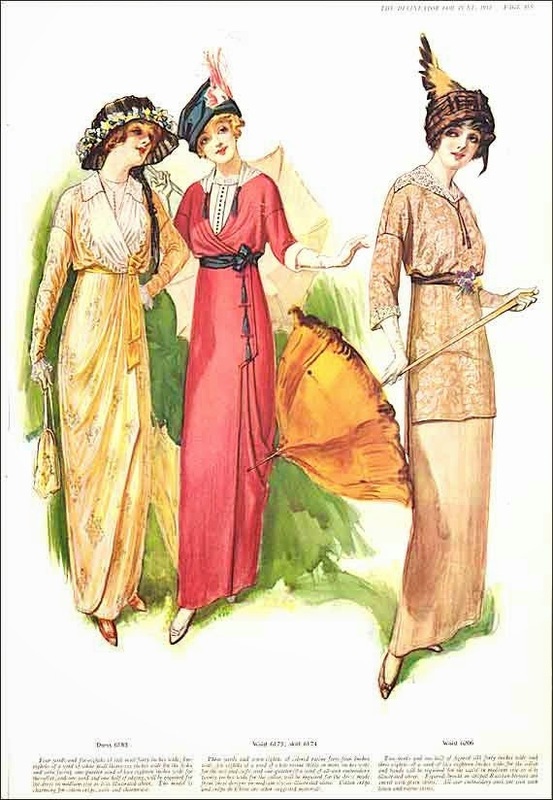 Of course I started doing my own research on the styles of dress worn in 1915. 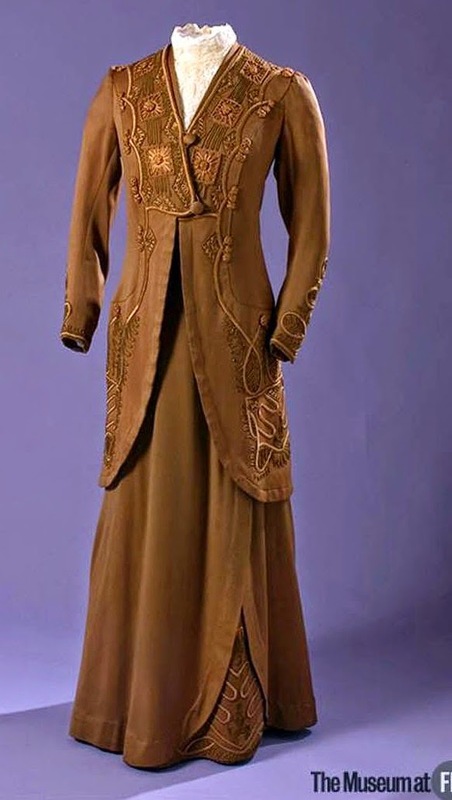 I figured styles from a couple years back would probably be worn too so included those back to 1912. 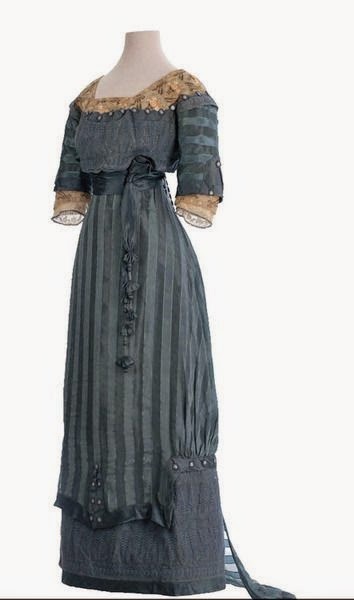 I mainly looked for day dresses that would be worn by the general public as they strolled through the park. 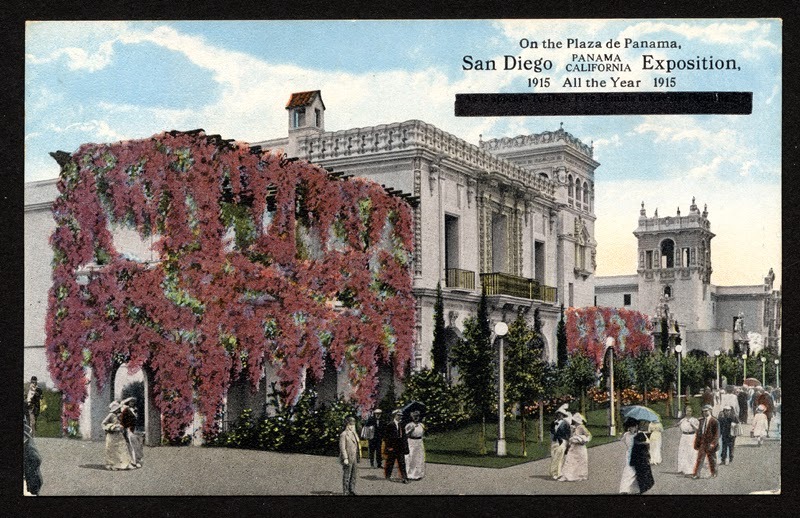 April in San Diego can still be cool but most of our cold and rain are usually gone by then. 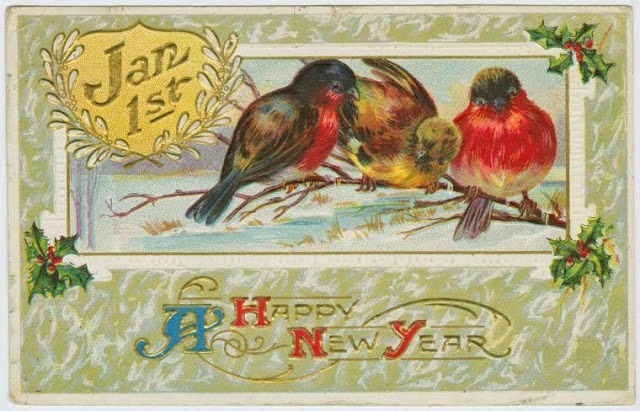 The fashion name for this time period was called the 'teens, referring to the second half of the year number, such as 19thirteen. 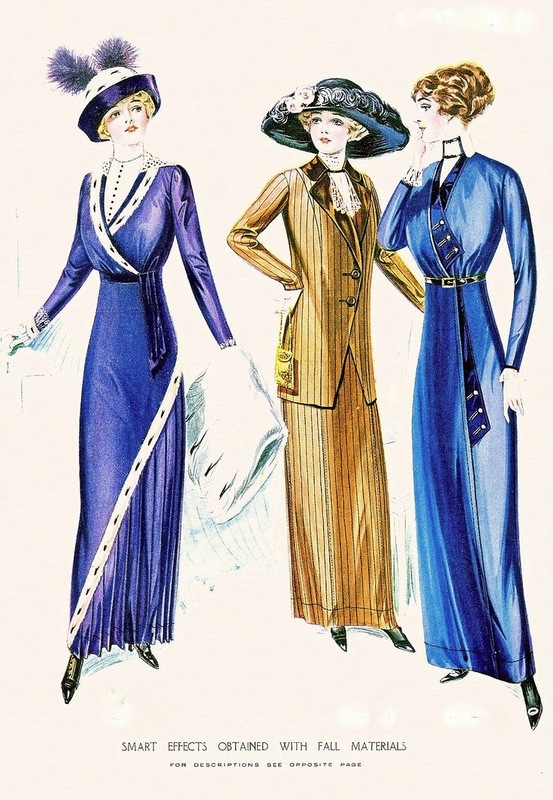 The styles ran from a dress, a skirt and blouse (aka shirtwaist or waist), or a walking suit. 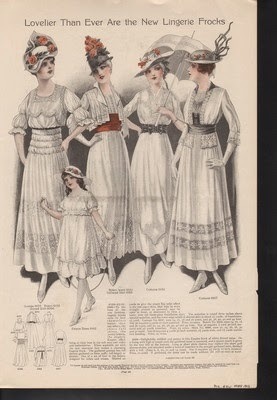 Starting in 1912 the waistlines are still slightly raised and drop to the natural waist by 1914. Skirt widths went from straight to slightly flared at the bottom. 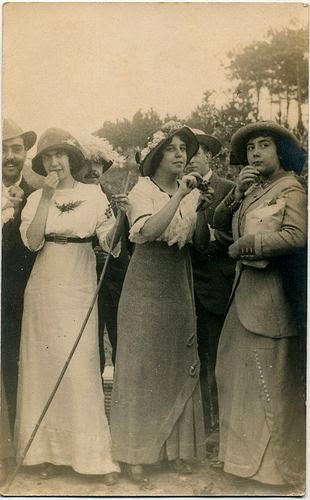 The length also started going up and by 1915 the ankles were showing, although colored stockings or spats were worn. 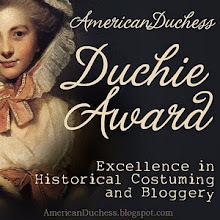 Dresses were still layered, going from the drapey bodice to clearly defined seams but still layered. 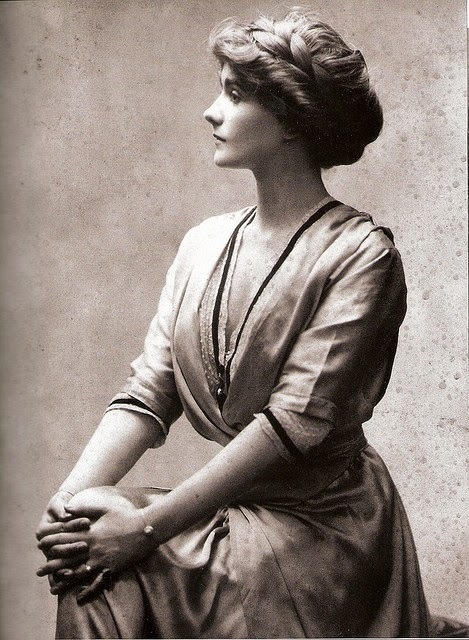 Skirts were often in two sections, a shorter length at the top, or a draped overskirt from the side. 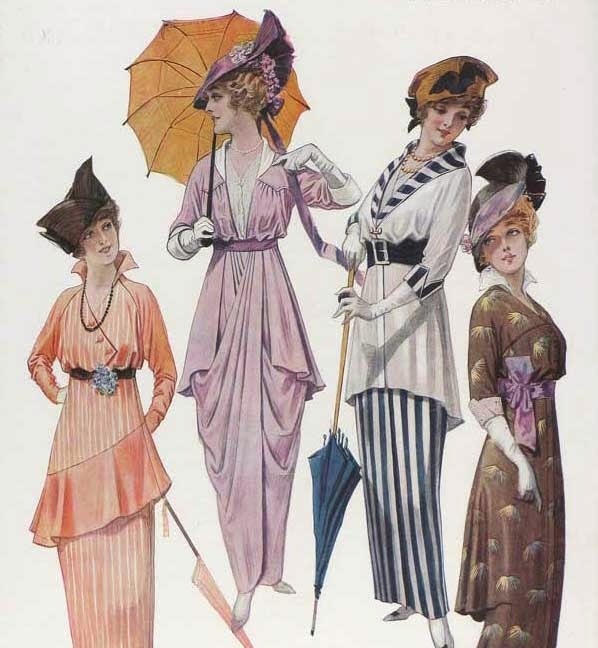 1914 showed a pulled-up drape on the sides creating an interesting look to the skirts. Necklines were varied but I see a lot of v-necks, with the majority of them having a center panel. 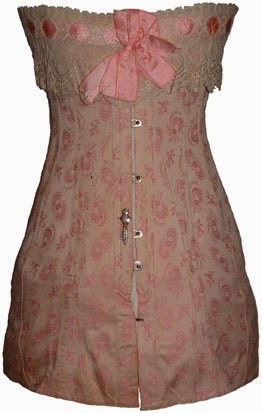 A recognizable style was the cross-over bodice, and with pointed or lace collars. 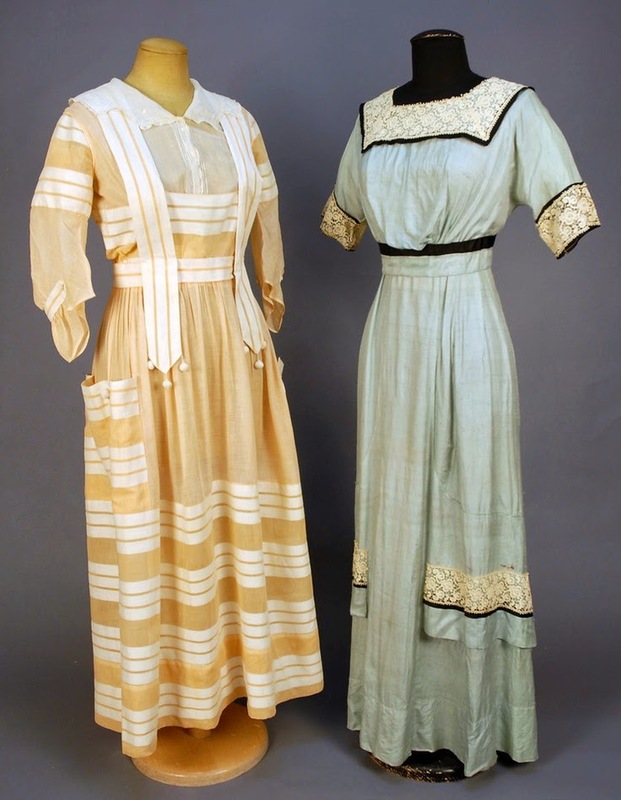 The photos I collected for my Pinterest page, 1915 Centennial Celebration, don't tell what the fabrics are but cottons and linens work well for the day dresses, and most likely there were silks. Fabric designs for day include solids, stripes, plaids and dots, and some florals, mostly in two colors. But I'm sure there were others out there. 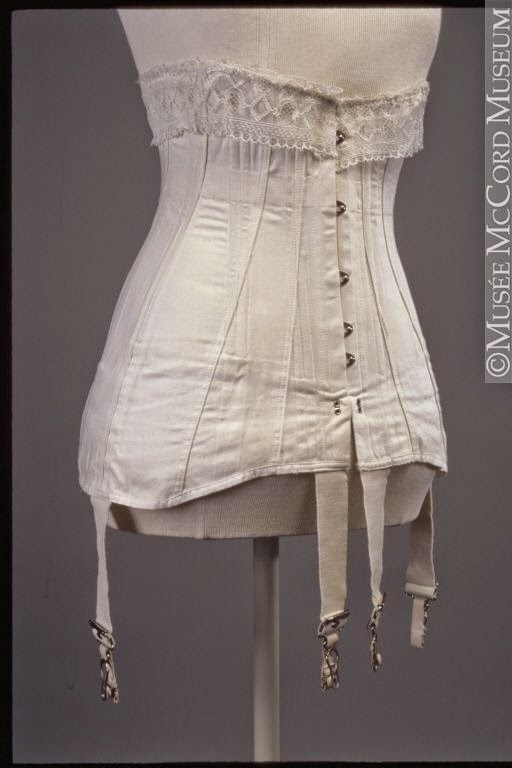 The underpinnings include an under-bust corset to have a smooth line of the hips. At one point they were very long but shortened later. By this time the chemises and drawers gave way to the combinations, which combined them into one piece with less bulk. The dress silhouette was soft with just a petticoat under them. 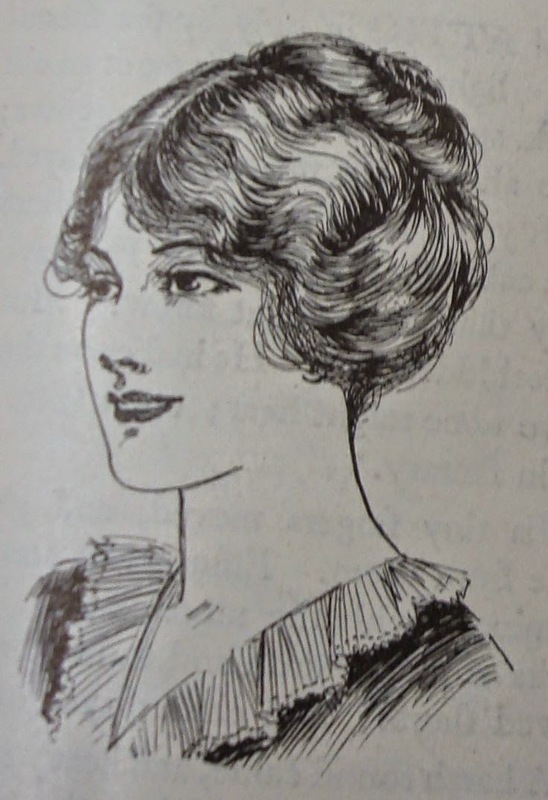 Hairstyles were soft with a slight fluff and curls. 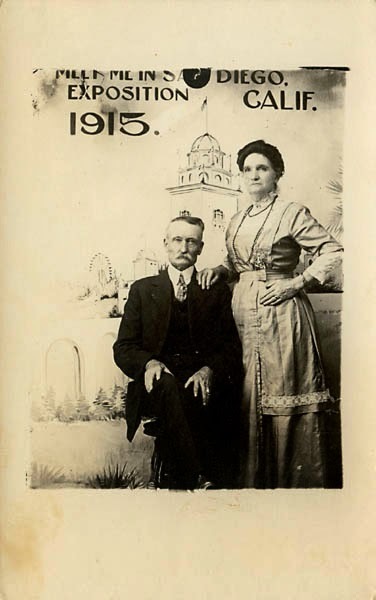 There still needed to be enough hair to hold up some of the larger hats so they wouldn't droop over your forehead and face. 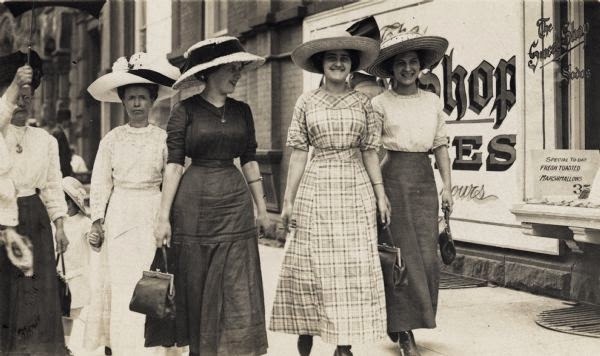 For accessories, hats came in a variety of shapes and sizes. Large hats to small perched-on-top hats. Trims were fairly simple with just a band of fabric, and a single feather or flower. Purses were changing from soft bags to leather. 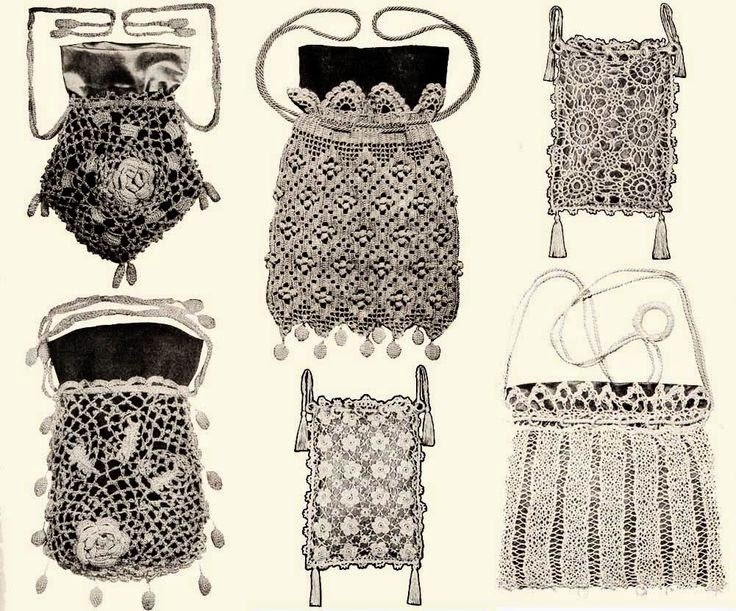 Patterns in 1912 for crocheted purses were shown, as well as the 1912 Sears catalogs with fabric bags but now with metal frames, both of which could still be made at home. 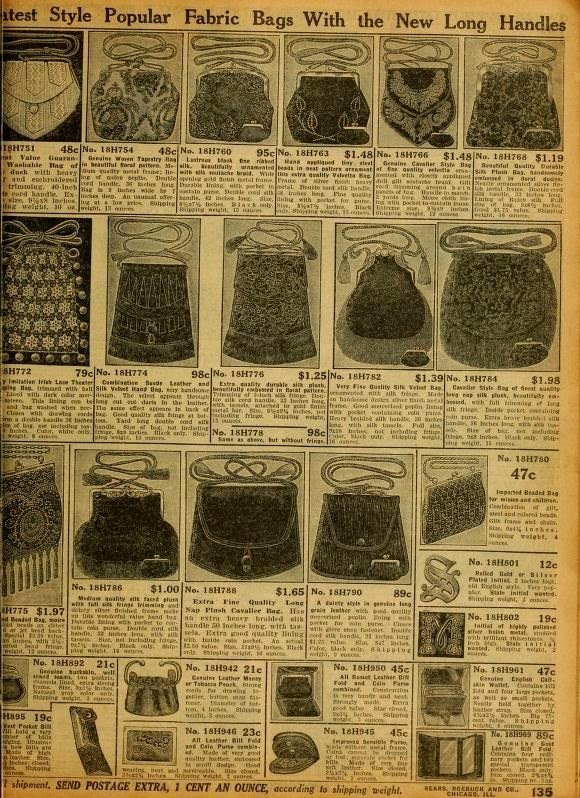 But leather purses were being advertised. There was one photo of an obviously well-to-do couple wearing a current stylish outfit, but not what the general public was wearing. There was still a lot of the white skirt and white blouse styles that were popular a good five years earlier. Ok, so I surprised myself when I'm trying to make a dress that was modern and up to date for that time period. 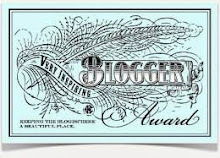 Love your post and appreciate your research! 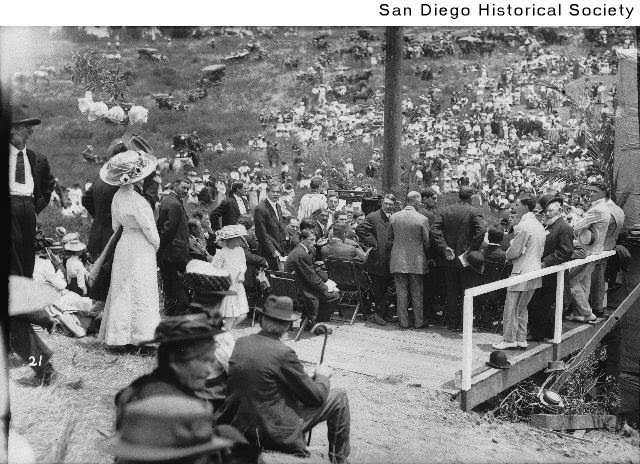 As new members of SDCG, we are looking forward to this years Centennial events. Love this post! What an era of beautiful style. 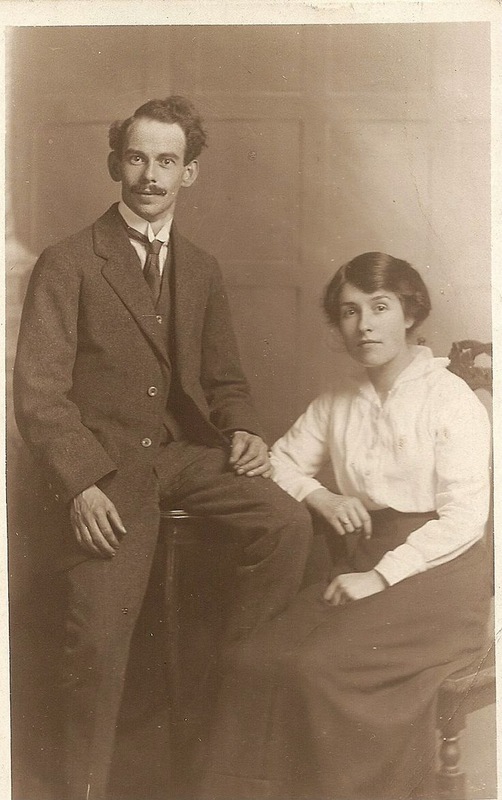 I am trying to get a good fix on men's styles of the 1900 - 1915s but I'm having problems getting the info. 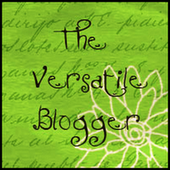 I would love to hear if this was any help to you. Pretty please! My Corset History; They aren't that scary.